'Clams' is the name given to a group of bivalve molluscs which encompasses razor clams, dog cockles, hard clams, Venus clams, Manila clams and carpet shell (or palourdes) clams. This collection only looks at the oval-shaped variety though, as razor clams have a whole section of their own. Clams are abundant along Britain's coastline and they are cheap and quick to cook – usually needing only quick exposure to intense heat. Clams are often steamed or boiled then added to pasta dishes, soups and chowders, though a purist might just pick the clams from their shells and serve them with a knob of butter and a dash of salt – or perhaps some mayonnaise and fresh herbs. Before cooking, check for any broken shells or clams that don't close when tapped – these are dead and shouldn't be eaten. It's important that any dirty shells are scrubbed clean as they often come into contact with the sauce or chowder. The clams then need to be soaked in heavily salted (enough salt to taste like sea water) cold water for 20 minutes, in which time the clams will naturally filter out any grit and sand. If they are particularly sandy, repeat the process with a fresh batch of salted water. After this process, leave to soak in fresh, unsalted cold water for 10 minutes to rinse out any excess salt they have absorbed. Usually, clams are added to a dish while still in their shells so the heat of the steam or sauce cooks them and forces the shells to pop open. If the recipe calls for raw clam meat, then it will have to be prised from the shell. The technique is similar to opening an oyster – for more information, see our instructional video on how to open a clam. 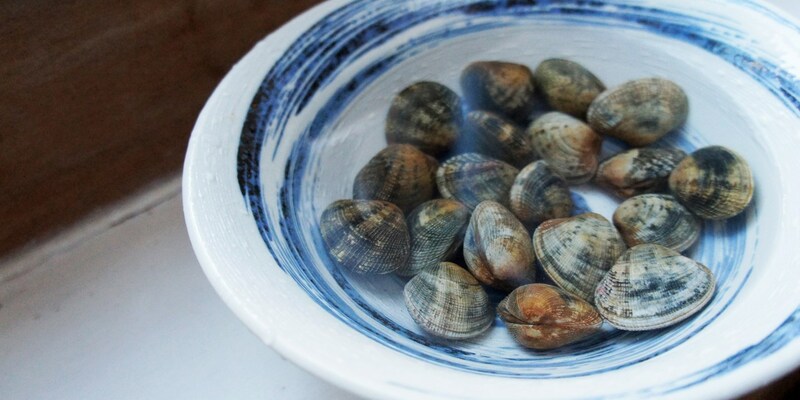 The most common way of cooking clams is to steam them. Take a heavy-bottomed saucepan with a lid that fits well and bring a few inches of liquid to a rapid simmer – perhaps water, wine, cider or fish stock. Tip the shells into a steamer or colander and expose them to the steam for 2 minutes, shaking from time to time, until the clam shells have all opened. It's also possible to cook fresh clams by immersing them straight in hot liquid, a jus or sauce. When making spaghetti vongole, the clams are usually added to the sauce for a couple of minutes at the end so that the heat of the sauce and pan cooks the meat and causes the shells to pop open. Clams don't actually need cooking. They can be eaten in their purest form as sashimi (usually with surf clams) or sucked right out of the shell. Clams can also be pickled, smoked and dried using a home dehydrator. Clams have a sort of in-built timer which means that the shells ping open when the meat is cooked. If you find yourself clawing at a shell of a cooked clam or struggling to prise it open, then it's an indication that you shouldn't be eating what's inside. One of the most popular ways of serving clams is with spaghetti or rice in vongole and paella. The shellfish doesn't rely on carbohydrates though – just look to Anna Hansen's cod with clams and chorizo to see how she harnesses flavours of the Mediterranean to work alongside clams. The juice and flesh inside clam shells enhance fish and seafood flavours already present in a dish so clams are often used to accompany fish fillets as demonstrated by Simon Hulstone's recipe for pan fried sea bass with butter spinach, clams, poached cod cheeks and fish sauce. For more inspiration, see Nathan Outlaw's John Dory with clams, apple and curry or Shaun Hill's turbot with spiced mussel and clam broth.